Yesterday, I finally fell victim to the flu. Since I’m stuck at home recuperating, I asked Chris if he could share some weather news with you. We ended up having a discussion about California’s drought that I think you’ll find interesting. Since 2011, California has been stuck in a drought that has wrung its cattle dry, desiccated its vegetation and drained its lakes. And although this year’s winter provided some welcome relief, the drought is still going to persist into the summer. The drought has taken its toll on the state. As the reservoirs dried up, municipal and agricultural water restrictions were put into place. Just a year ago, farmers were pulling nut and fruit trees out of the ground so there would be more water for the surviving trees. Planting vegetables has been curtailed, and vineyards have been short of water. Four years of drought have drained reservoirs, cutting off water supplies. Farmers and ranchers have, where feasible, drilled wells to reach water. But now nature is attempting to relieve the drought. Ample rainfall since November 1 is greening the landscape and replenishing reservoirs. Clouds have produced 20 or more inches of rain across northern California, including spotty amounts of 50 to 60 inches. Rainfall has been lighter over southern California — up to 12 inches in the mountains and 1 to 4 inches in the valleys. 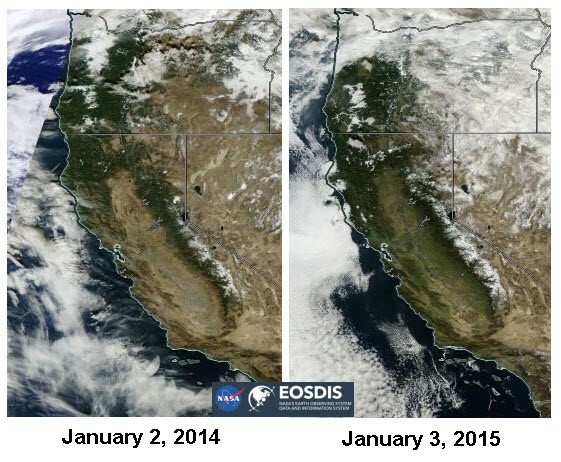 These satellite images show the difference a year can make in drought conditions. In January 2014, the landscape was brown with mountain evergreen trees as the only green features. This year, there’s widespread green grass and brush. However, California’s not out of the woods yet. While abundant rain will fall through May, the weather will turn dry for the summer. And next winter, El Niño will be very weak, next to non-existent, and that could plunge the region back into a drought. You see, California is always teetering on the edge of a water shortage. That’s why there are 1,300 named reservoirs in the state. Most of the state’s lakes are not natural. Tree rings show that the state has had multiple 10- and 20-year droughts since AD 500. It so happens that major shifts in Pacific Ocean patterns occur every 10 years or so. The current drought started just after the latest shift occurred. This coming growing season will be better than last year, but not ideal. There’s still not enough water to meet all of the state’s needs. It takes time to rebuild after a drought. In fact, it takes up to three years to rebuild cattle herds and an entire growing season to grow row crops. And the time it takes to undo the stress caused by the drought on nuts and fruits varies. Some, like asparagus, will bounce back. Others may take a year or more to recover. Californians, and everyone else who enjoys dairy products, nuts, strawberries and the general cornucopia of the state’s agriculture industry, will have to get used to higher prices if rainfall next winter is below normal. Cedar Fair (NYSE: FUN), the amusement-park operator, has already surged nearly 10% this year, after Credit Suisse initiated coverage on the company on the day we made our recommendation. The investment banks’ $53 price target for the stock sent the shares rallying from $47.50 on the day of the note to about $50.50 today. Credit Suisse explained how Cedar Fair collected $28 a person on average last year, compared to $25 a person for Six Flags, a rival competitor. But a main driver for its buy recommendation was the payout. As you know, generating income these days is a challenge. Cedar Fair dishes out a solid 6% yield, which is far better than the sub-2% the S&P 500 is paying on average. This is great for our June 2015 option (FUN150619C00045000). We are up nearly 60% in just three weeks. Cedar Fair is our warm-weather trade. I recommended it in anticipation of investors buying shares ahead of the spring, and that has yet to play out. So we are in a great position to realize a massive gain in the coming months. This is a rising wedge pattern for Vail Resorts, illustrating a bearish trend. It depicts a momentum slowdown for the stock — which is exactly what we need to turn our put option around. Since buyers are losing the battle to carry the stock higher, it is just a matter of time before the sellers send the stock down. You can see where the battle lies: buyers are along the support trend line and sellers are crowding the resistance. One side has to give. Once the stock breaks out, we are likely to see a quick move in either direction. Given the tightness of the pattern, I expect we will see a sharp drop in the next week or so. Our put option is down about 10% at the moment, but once Vail breaks the support line, we will be profitable in quick fashion.